Estate by the Lake! outdoor Pool! 7000 square feet! We would like to welcome you to an estate that will meet and exceed your expectations. 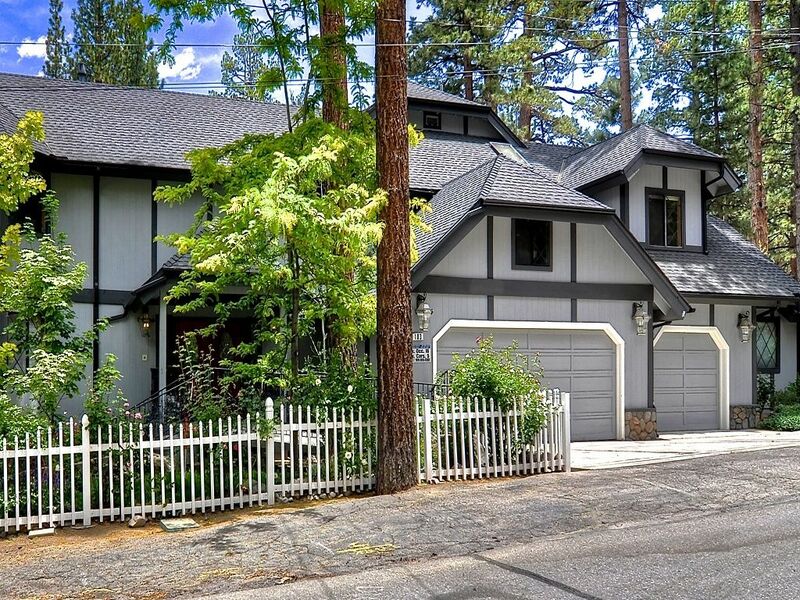 As you walk through the doors you will feel the warmth and detail in this gorgeous home while offering a combination of amenities that you will not be able to find anywhere else in Big Bear. Imagine floating in the sparkling Pebbletech pool enjoying the mountain air, while planning a morning fishing trip across the street at the lake. The luxurious yard has tons of decking, a sunken outdoor spa, plenty of grass, and beautiful tall pine trees. Inside, there is plenty of room for up to 16 guests with an amazing kitchen, huge dining room with 25 foot ceilings, a built in home theater, lounge, and a game room. A level entrance and 2 downstairs bedrooms make this home completely handicapped accessible as well! Five of the bedrooms are master suites and a couple offer Jacuzzi tubs or even a steam shower. There is a kids bedroom that is open to the game room and has 2 sets of single/double bunk beds. The master bedroom has a luxurious king sized bed along with a beautiful spa like bathroom. With 7000 square feet, 6 bedrooms, 5.5 baths, a beautiful pool (available during summer months only), spa, pool table, room for 16, and lake access across the street there will be something for everybody! Swimming, fishing, skiing, golfing, tubing, jet ski, boating, water ski, snowboarding, snow play, Shopping, hiking, sailing, restaurants, relaxing! Steam room, whole house fan, huge yard, across from the lake. This house will always be special to me. We stayed here in June of 2009. It was the last time our entire family was together before my Grandfather passed away. This house may not be a log cabin but it is HUGE, well spread out, and has plenty for everyone to do. Everyone was entertained, young and old. The layout was awesome. People could be in the game room, the living room, playing pool, swimming outside, in the kitchen...and it was amazing. The decor is a little cheesy and outdated/overly grand, but it's a GREAT place for a large group, for the price. I think that if they put some $$ into redecorating it to feel more like a cabin and less like a palace, it would be perfect. The house itself is gorgeous from the outside and at first glance inside as well. It is NOT on the lake and though it is close to the lake you CANNOT access the lake near the property. It holds 16 people very comfortably and the beds were comfortable in all rooms but one. The kitchen had mold growing on the ceiling which apparently has been there for quite some time, according to the owners own preferred "fix it" man due to leaking outside wood, there was a pool man there 3 out of 5 days that we were there but there is NO WAY to heat the pool, the grass (we were there end of July) remains very muddy and damp so hard for kids to play on, there is no manual on how to work the stuff in the house so you kind of have to figure it out by luck. Only 3 out of 5 burners in the kitchen worked. We did call the management company to complain about these issues as well as the WIFI being down and a beehive being right on the patio and they did send out a crew but the crew themselves said the things are fixable..they need to be replaced and the owner is aware and does not choose to do anything at this time. For the money we spent, I expected more. All that being said......it held 16 of us comfortably and we still had a great time. I didn't realize this was also listed on VRBO. I would have written a review right after we stayed. We rented through Five Star who were extremely helpful also. Actually stayed in December 2009 for 3 nights either first weekend or second weekend - I can't remember which. My husband and I decided the family needed a get-together to take our minds off of tough times and thought we'd surprise everyone with a luxury weekend. Wow! Everyone is still talking about it and we're doing our best to fit it in our budget again this year. I can't tell you how amazing our stay was and we thoroughly enjoyed all the family pictures. Would love someday to also be able to spend time in the spring or summer. The best part was watching mom (81) enjoy her three daughters, husbands, grandchildren and great grandchildren and she insisted we play scrabble until we dropped! Thank you so much for making your home our home! !